One of the greatest preachers and teachers of the Scripture is widely regarded to be St. John Chrysostom who lived and died over 1,600 years ago. We in America especially honor the memory of a man who lived and walked among us who has been called “The New Chrysostom” or “The Serbian Chrysostom” for his gift of preaching and teaching. 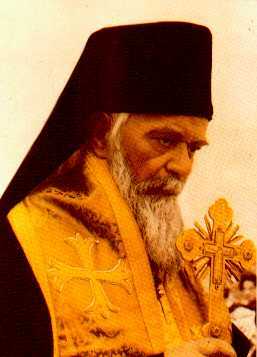 St. Nicholas Velimirovich was born in 1880 in the small Serbian village of Lelich to pious Serbian Orthodox parents. He grew up in a home imbued with the life of the Orthodox Faith. His parents often interrupted their farm work for daily prayer and observed and celebrated all of the fasts and feastdays of the Church. His mother was often seen taking her little Nikola by the hand and walking three miles to the Chelije Monastery for prayer, Confession and Holy Communion. Later in life, St. Nicholas remembered these walks with his mother as being some of the most influential experiences of his life. After completing elementary school, Nicholas applied for entrance into the military academy but was denied due to his physical limitations. Obviously, it was the will of God for the young boy to be enrolled in another army. With the encouragement of his parents and parish priest, Nicholas applied for entrance to the seminary in Belgrade and was accepted. In 1905, because of his outstanding academic abilities, he was chosen to continue his studies in Russia and Western Europe. Nicholas blossomed as he was offered the best educations that Europe had to offer. In 1908 he received his Doctorate in Theology from the University of Berne, Switzerland. One year later, this veritable genius earned a second Doctorate in Philosophy from Oxford, England. Shortly after completing his studies, St. Nicholas became seriously ill with dysentery and lay in a hospital for two months. As often happens to people, this crisis was a turning point in his life, causing him to decide to dedicate his life to the service of God. He was tonsured a monk and ordained to the priesthood on the same day. St. Nicholas was appointed a teacher in the seminary teaching philosophy, logic, history and foreign languages. With the outbreak of World War I in 1914 the Serbian nation was in the midst of turmoil and needed a leader to help them through this crisis. Because of his education in England, St. Nicholas was sent on a diplomatic mission in order to enlist the support of the British government in aiding the Serbian people. A second diplomatic mission came in 1915, this time to New York City to rally support and aid for the Serbian nation. As the war came to an end, St. Nicholas returned home to Belgrade and became involved in the formation of the new Yugoslav state. In 1919 at the age of 39 he was elected as the bishop of the Diocese of Zhicha and later transferred to the Diocese of Ochrid and Bitola. He was responsible for the establishment of five orphanages and became affectionately known as “Deda Vladyka” (Grandfather Bishop). In 1921, St. Nicholas arrived back in New York City having been invited to deliver lectures at various universities and Anglican Churches including Columbia University and the African-American Church of St. Philip in Harlem. Along with his talks his purpose in America was to collect funds to establish orphanages in Serbia and to investigate the possibility of establishing a Serbian Orthodox Diocese in America. 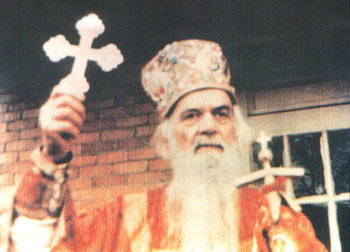 He was the first Serbian Orthodox bishop to visit the United States and he labored for six months to strengthen his fellow Serbs in the union with Christ and His Church. Returning to Serbia, St. Nicholas resumed his episcopal ministry and immersed himself in writing, teaching and preaching. In 1928 he wrote his 1,000 page book “The Prologue of Ochrid” consisting of lives of the Saints and mediations for every day of the year. This book has been translated into English and is very popular today among American Orthodox Christians. He began a religious renewal movement known as “Bogomoljacki Pokret” (Movement of God-Prayers) whose members were devoted to reading Scripture, singing spiritual songs which St. Nicholas composed, regular Confession and Communion, keeping of the fasts, daily prayer, and travels to monasteries. Through this lay movement, the entire Serbian Church along with its monasteries were revitalized and renewed. St. Nicholas made his third visit to the United States in 1927 at the invitation of the Institute of Politics in Williamstown, Massachusetts and the Carnegie Endowment for World Peace. Being as astute observer of the times as well as a spiritual giant, St. Nicholas repeatedly warned that a great catastrophe was threatening Europe and the world. His message was clear: “Repent, for the Kingdom of God is near”. When his predictions came to pass and Europe was engulfed in World War II, the Nazis arrested Bishop Nicholas along with Patriarch Gabriel of Serbia and incarcerated them in the infamous Dachau Concentration Camp in Germany. He spent two years in this camp witnessing some of the cruelest torture ever inflicted upon one man by another, attributing his survival to the intercession of the Blessed Virgin Mary. After the war, the holy bishop came back to America for the fourth and final time. Because of his academic achievements he was awarded his final Doctorate in Sacred Theology from Columbia University in New York City. Thank you, Lord – in him we have a new apostle! Thank you, Lord – in him we have a new evangelist! Thank you, Lord – in him we have a new confessor! Thank you, Lord – in him we have a new martyr! Thank you, Lord – in him we have a new saint! It seems true that while belief and piety often run in families, indifference and apathy towards the Faith also seems to run in families. If children are not brought to church weekly, taught the importance of prayer and observe their parents praying it is unlikely that they will be interested in these things as adults. If parents speak to their children of the importance of faith in Christ but routinely skip the Sunday Divine Liturgy for soccer and other sports children learn that faith in Christ is not all that important after all. I have often silently observed children growing up in the churches that I have served as pastor and can generally predict which ones will eventually fall away from the Lord and His Church. Those children whose parents are lukewarm in their practice of the Faith and only occasionally attend services were usually the ones who grew up with little interest in their Orthodox Faith. In 1994 a research study in Switzerland discovered this to be true. If both a father and mother attend church services regularly, 33% of their children will continue as regular church goers. When neither parent is a regular participant in the practice of the Faith, only 4% of the children will become regular participants. While exceptions do exist: some saints were raised in atheistic families, it is generally true that spiritually indifferent families produce spiritually indifferent children. A second significant facet of the life of St. Nicholas was his intellectual gifts. He possessed five doctorate degrees and spoke seven languages! How often our young adults go off to college and lose their faith! For St. Nicholas the opposite was true. As he grew in education and knowledge he grew in love and devotion to the Lord Jesus Christ. Intellectual education can lead our young people away from the Lord if there is not a strong foundation and education in the Faith. A Greek Orthodox bishop, visiting in America for the first time, made an astute observation. He noted that American Orthodox young people are highly educated with advanced degrees in the arts and sciences but with their Orthodox Faith, their spiritual education consists of a few Bible stories they learned years ago in Sunday School. I have heard young adults share how they questioned and abandoned the Orthodox Faith as they observed the suffering and evil in the world and concluded that God cannot possibly exist. And yet these same highly educated, former Orthodox Christians cannot quote a single verse of the Bible that addresses the issue of the presence of pain and suffering in the world. to secure aid for God’s suffering children. in the Eternal Homeland of God’s Kingdom. you have attained the crown of eternal life.